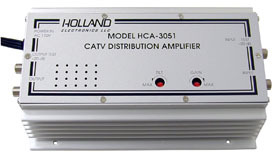 The HCA Series amplifiers incorporate high quality push-pull hybrid modules to provide the highest output and lowest distortion levels possible. A regulated power supply along with an extra large heatsink case provide the reliability required for operation in the most hostile environments. Note: If you have a very large home (maybe with separate additions) or a MDU property with 10's and 100's of outlets like Apartment Buildings, Hotels, Motels and the like!!! This is the Distribution amplifier you've been looking for. It is return band blacked and wil NOT maintain Modem and Subscriber set-top terminal connections. It comes with an adjustable Gain control, so you can find that sweet spot and save (in reserve) some gain for future additions and signal Splitter, or balance the amplifier out to feed another amp at the other end of a cable segment to extend your systems reach to another building. This is a 550 MHz bandwidth Amplifier for Some Cable TV Systems only and will not push Off-Air UHF DTV Signals. Check Your Picture quality where the Cable TV feed enters your complex, if it's good there, you can replace connectors, cable and Splitter to bring your installation up to the newest specifications. If you are feeding numerous TV sets with Set-Top Converters or Digital Boxes with Pay Per View Movies (this Amp can feed Ton's o' TV's), Cable Modems and/or long Distances, use this Amplifier before the Splitter To maintain Signal Quality. If the Picture quality is Poor at the Feed point of your property (the Cable Company usually has a Grey box used as a Demarcation Point for this Purpose), call your Cable TV Company, so they can effect repair.